The SAP Solution Manager provides two sets of Fiori Launchpad tile catalogs for the deployment options we support. That means, depending on the Fiori Launchpad scenarios you choose, you will have access to differing numbers of launchpad tiles. For the “embedded” Solution Manager Launchpad option, we provide catalogs with tiles for all the major Solution Manager applications. This includes Fiori and other UI5 applications as well as Web Dynpro and CRM WebClient UI applications. For the central front-end server (Central Hub) Launchpad deployment option, we provide a subset of tiles, namely only those for the Fiori applications. This is because only Fiori applications support a straight-forward deployment on a central launchpad. Create your own tile catalogs and groups in the central launchpad. In your catalogs, create URL tiles which launch the respective Solution Manager applications. SAP does not ship these tiles because only you have the complete information required for the URLs, such as the fully qualified domain names, port numbers, etc. of your Solution Manager system. URL tiles do not support the same integration as do the tiles for Web Dynpro applications in the embedded Solution Manager launchpad, nor do they support the same frontend/backend separation which Fiori apps provide. Still, for most use cases URL tiles are sufficient. In this article I describe how you can find tiles only shipped on the Solution Manager system and how, with a little effort, you can create your own tiles on your central launchpad which link to the same applications as the Solution Manager specific tiles. The embedded launchpad runs as part of SAP Solution Manager system and only provides content available within the Solution Manager. The Central Launchpad (Front-end Server, Central Hub) runs on an independent SAP NetWeaver system and can provide central access to applications running on several backend systems. We provide the embedded option in the Solution Manager to get you up and running as soon as possible. Setting up a central launchpad takes more effort but allows you to have a central access point to applications interacting with many different systems. You can view all launchpad tile catalogs in the respective system by calling the Fiori Launchpad Designer (Cross Client) application (transaction /UI2/FLPD_CONF). All catalogs which are deployable on the central launchpad are included in software component ST-UI and have technical names with the prefix SAP_STUI (example: SAP_STUI_ITSM_MYINC_TC – SAP Solution Manager Incident Management). 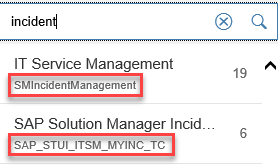 You can see in the following screenshot the two catalogs we provide for IT Service Management: SMIncidentManagement is the one only available in the Solution Manager embedded launchpad and contains all related applications. SAP_STUI_ITSM_MYINC_TC is also available in the central launchpad, provided you install software component ST-UI there; it contains only tiles for the related Fiori apps. Determine the URL of the Solution Manager application. In the central launchpad, create a new tile which launches the URL. “Clean” the URL by removing unnecessary parameters and session information. Ensure that you copy the URL of the actual application and not that of a framework application. For example, CRM WebClient Applications, when launched, may contain session information embedded in the URL. It will look something like “https://<server:port>/sap(bD1lbiZaPTMwMCZkPW1pbg==)/bc/bsp…”. You should delete all the information within and including the parenthesis before using the URL for other users. In particular, most Web Dynpro applications in the Solution Manager launchpad will run in a launchpad “shell”. The URL you see in your browser will be that of the embedded launchpad and not that of the actual Web Dynpro application. Copy the URL from the resulting dialog box: This is the URL which will start the Web Dynpro application directly, and not the Solution Manager’s launchpad shell. For a full explanation of how to do this, see my previous blog article, SAP Fiori Launchpad in SAP Solution Manager – Creating Your Own Tile Catalogs, Groups, and Roles. Call the Fiori Launchpad Designer, transaction /UI2/FLPD_CONF (cross-client) or /UI2/FLPD_CUST (client specific). Create a new tile catalog, or select an existing one of your own. By following this process, you’ll be able to access any URL-based application (in the Solution Manager or otherwise) from your central launchpad, even if SAP does not ship a tile for the application. 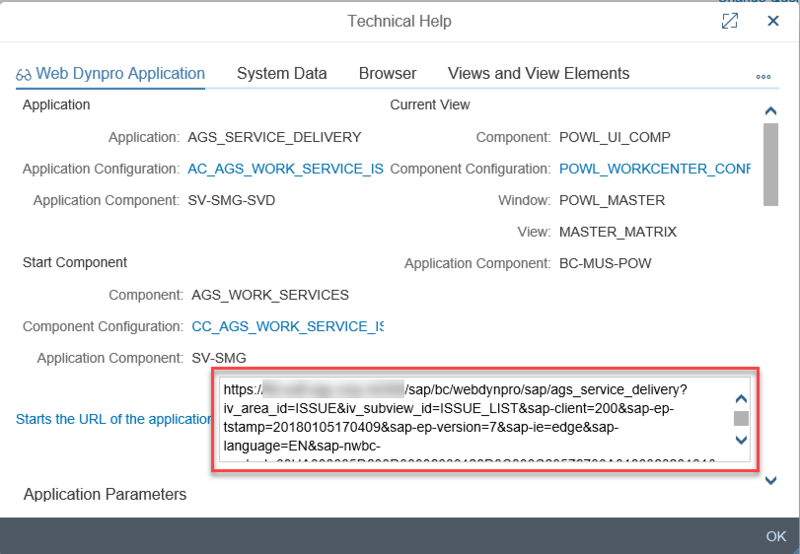 SAP Help Portal: SAP Fiori for SAP Solution Manager – Select your ST-UI support package level and view the application help. The application help lists the respective Fiori apps, their catalogs and authorization roles. These are the applications which can be directly deployed on the central launchpad. Blog article: Using the SAP Fiori Launchpad in the SAP Solution Manager – An introduction to the Launchpad as used with the Solution Manager. Blog article: The SAP Fiori Launchpad in the SAP Solution Manager – Correcting Links Using Customization – How to override tile destinations delivered by SAP. Blog article: SAP Fiori Launchpad in SAP Solution Manager – Creating Your Own Tile Catalogs, Groups, and Roles – This article goes into the details of tile creation.